We’ve talked before about our kids who hate scratchy tags, stiff clothes, and basically every shoe on earth. I have one of those – Scarlet has some sensory problems with clothing, and shopping for her has always been a hassle. I know from the feedback we’ve had on this site and our facebook page that I am definitely not the only parent who deals with these issues. So I was super excited when Zappos contacted us to tell us about the launch of Zappos Adaptive: Functional and Fashionable Products to Make Life Easier. This is a whole section of their site dedicated to clothing for adults and kids with special needs – whether you are in a wheelchair or suffer from foot problems or have a family member who wants to feel more independent by being able to dress themselves more easily, there is a ton of stuff brought together in one place at Zappos Adaptive. 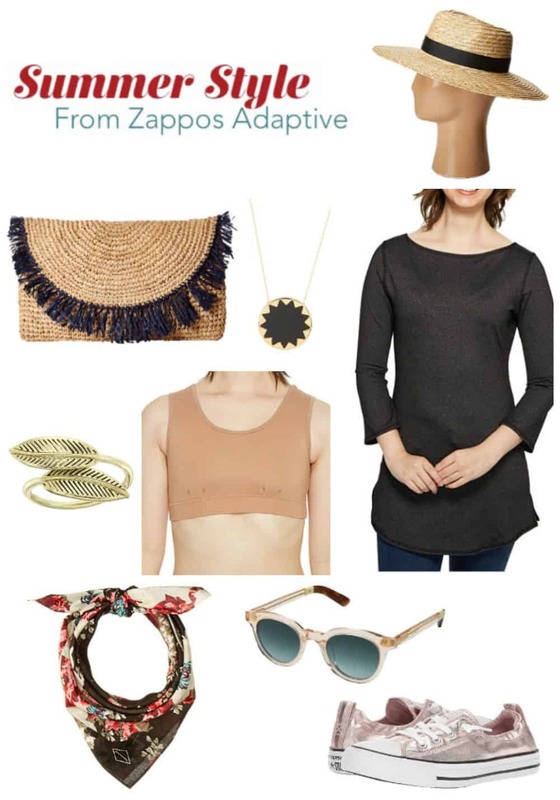 We have always loved shopping at Zappos, but we love it even more now that they offer these adaptive options. 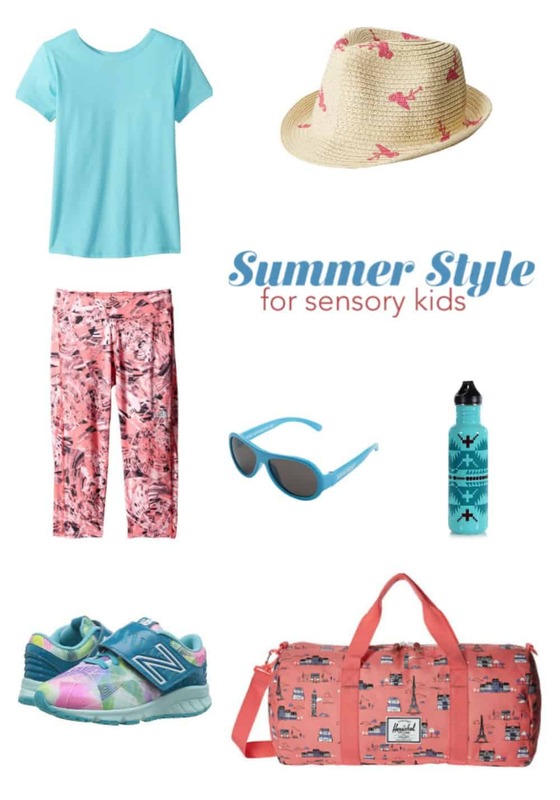 Check out these adorable summer style pics from Zappos for sensitive kiddos. The t-shirt may look like simple clothing, but it’s a revelation for sensory kids because is has flatlock seams (no irritation from regular stiching) and tear away tags that are water soluble (no cutting off tags and getting scratched by the remnants). The pants are easy-on, easy-off pull on pants that give that feeling of being “hugged” that sensory kids like. The shoes are pull on – the laces are elastic so they’re also great for kids who can’t tie their shoes for whatever reason. Because Scarlet is always wearing the simplest, softest clothing, I try to have more fun with accessories. What do you think of these looks? Clockwise from top left: 4Ward Clothing Long Sleeve Raglan Shirt, Appaman Kids Houston Fedora, Pendleton Stainless Steel Water Bottle, Herschel Supply Co. Pop Quiz, Vans Classic Slip-On™ Core Classics, 4Ward Clothing Four-Way Reversible Shorts, Ray-Ban Junior. And if you’re a mama with a need for adaptive clothing, Zappos Adaptive has some super cute options! I don’t necessarily need adaptive clothing myself, but I still need this shirt (because it’s soft and it’s LONG…shirts are never long enough for me). Independence Day Clothing is a brand made for people who need clothes that are easier to get on and off while also being comfy to wear. I am loving that shirt, but also this bra. I would rock these two all day long (so soft) with any of my favorite leggings, here’s how I am styling them. Gotta have my chucks, in a fun metallic (also part of the adaptive collection at Zappos), and a cute straw hat (get the sun off my face) and all the jewelry and bags. Clockwise from top right: Lack of Color The Spencer Fedora, Independence Day Clothing Co Reversible Boat Neck Tunic, TOMS Fin Peach Crystal Sunglasses, Converse Chuck Taylor® All Star® Shoreline Metallic, rag & bone Kimono Floral Bandana, House of Harlow 1960 Sacred Leaf Wrap Ring, Hat Attack Sunshine Clutch, House of Harlow 1960 Sunburst Pendant with Black Leather, Independence Day Clothing Co Reversible Essential Bralette. Jacinda and I firmly believe that whatever your needs are, you and your family should be able to feel cute and comfortable in what you wear. We are thrilled to know that Zappos agrees, and has created a shop for people who need just a little bit more functionality and comfort from their clothing. If you’ve ever wanted or needed clothing or shoes that foster independence and put ease and comfort first, check out Zappos Adaptive.